This afternoon I opened a new page on my site called PCRY about the creation, destruction and re-creation of my home model railroad layout complete with pictures. In the next couple days I will also open a page SP&S, about my Grandfathers time as a fireman on the line from Vancouver to Wishram, Washington. Hopefully, I will soon go back to building the layout. This entry was posted in Website building and tagged PCRy, SP&S on October 26, 2015 by Capt.Brigg. If you visit this site more than once you may find that it looks very different each time for the first few weeks. I am using WordPress as the site builder and there are several hundred templates that can be tried and used. I am also reading Tris Hussey’s WordPress, Absolute Beginner’s Guide and it is a great help for a novice like me. This entry was posted in Website building and tagged WordPress on October 24, 2015 by Capt.Brigg. 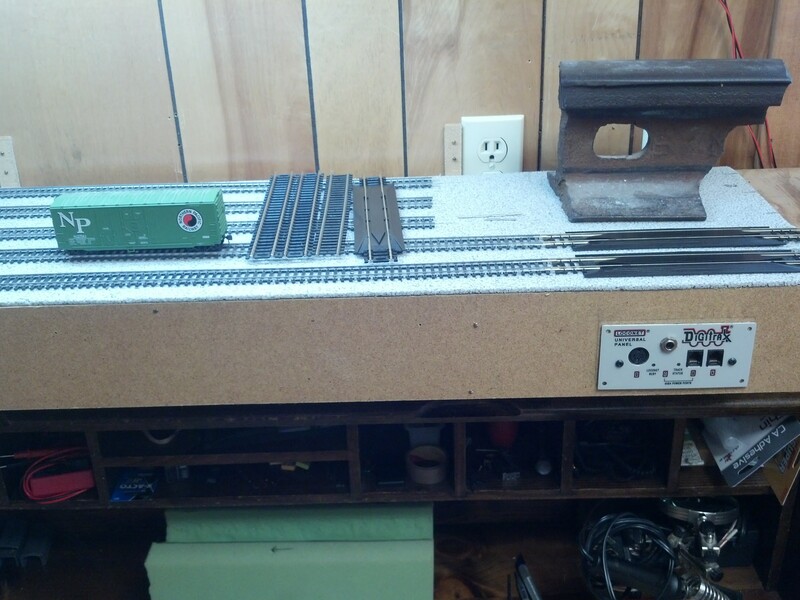 I have started building the staging yard and digital programming track for my layout. The fascia board will have on-off switches for each track, so engines on those tracks do not draw power while idling. The programming track, the closest track, will also be able to be switched to an operations track and will be part of a reversing “Y” in staging. You may notice the full size piece of rail I use as a weight, I won’t be running trains on it. This entry was posted in Layout Construction and tagged Laying track on October 23, 2015 by Capt.Brigg. I finally got the site email working: capt.brigg@pacificcascaderailway.com. I had to get a DreamHost tech to fix something on the server that was keeping the incoming mail from working. I can now keep working on the site layout to get something I am happy with. This entry was posted in Website building and tagged email on October 21, 2015 by Capt.Brigg. After an extended derail, we are once again on track. For the next few days we will be building this showcase of the Pacific Cascade Railway. Visit us for regular updates on the web site and the HO gauge layout. This entry was posted in Website building and tagged Construction on October 20, 2015 by Capt.Brigg.